This adorable Mermaid Crown is completely handmade. 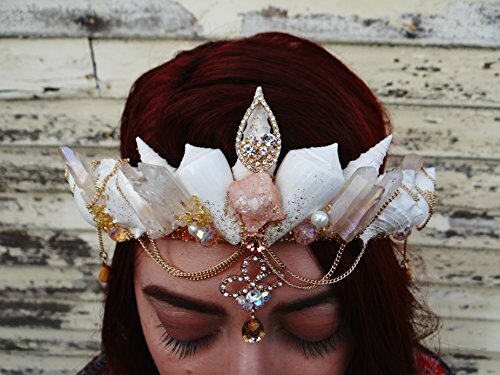 Details of this crown include an elastic band to ensure a secure fit, seashells(real), white glass beads, rhinestone charm, peach druzy crystal, and smokey quartz crystals. The center of the crown measures 3 inches tall and can fit any hairstyle. The mermaid crown is perfect for your birthday photographs, mermaid costume, or for a decoration! (center eyepiece may vary) PLEASE READ: This item is made to order, meaning it is ready to be shipped after 7 days from the purchase. I create all handmade items with love and care in my work studio in the sunny state of California.